if the unit is switched off and on again. Fully protected, secondary by high speed, micro-processor controlled, resettable electronic trip. Over-current is measured and timed for cases of serious overload and slight overload to decide tripping time This avoids over-sensitive tripping in cases of initial heavy current surge, for example when using lamp bulbs. Please note that these are not regulated power supplies. practical r.m.s values of 0 -15V at no load. 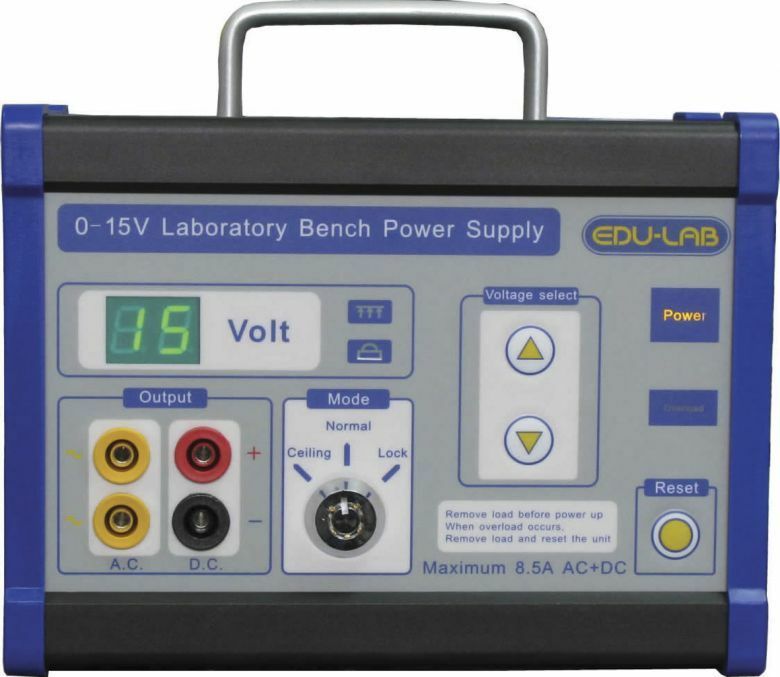 "The 605-055 are unregulated power supplies so, it is normal for the output voltage to be higher than selected when they are under low or no load. It will approach the selected value as the load approaches full rated current. The digital display on the front of the unit only indicates the transformer tapping selected; it is not a voltmeter connected to the output.The discrepancy between the selected and actual voltages will be larger for the DC output under low loads as this output is a rectified version of the AC output. At very low currents the rectifier and smoothing capacitor will be picking the tops off the AC waveform so the DC voltage will be close to √2 times the RMS AC voltage."